Photo courtesy of Chris Keefer. Freshman Sean Keefer is remembered by former classmates and professors as an extraordinarily bright and introverted student. 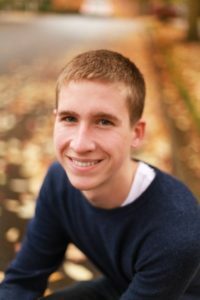 Keefer, the 19-year-old who was found dead in his West Hall bedroom Tuesday, belonged to one of the University’s most prestigious academic programs and was one of the top students in the engineering school. A member of the University Honors Program, he was also one of four freshmen selected for the coveted Clark Engineering Scholarship program this year. Keefer, who lived in West Linn, Ore., was studying mathematics and computer science. “Although in his first year, he was so far ahead,” Youssef said. Freshman Christine Seo, who went to high school with Keefer, said he was also one of the top students in their class. He was shy, but kind when he came “out of his shell,” she said. It was sometimes “difficult to get more than a few words out of him,” she added. Seo said she and Keefer met their junior year when he went to prom with her friend. She remembers talking to him about where they were living on campus, but hadn’t seen him since coming to college. “He was excited to come to GW,” Seo said. About a month after he arrived on campus, Keefer began interning for the OpenGov Foundation, a government accountability and transparency group. His first project was to compile the first online edition of the laws of Raleigh, N.C.
“Sean was a wonderful young man who loved to run and listen to music, but most of all, loved to code,” according to a statement on OpenGov’s website. Campus and city police officers found Keefer unconscious in his bed Tuesday, according to police documents. Officers have ruled out a homicide, according to police documents, but the D.C. Chief Medical Examiner’s Office could not yet confirm the cause of his death. He is survived by his parents and two younger sisters. The death was the first to occur in a GW residence hall since 20-year-old Ismail Ginwala committed suicide in City Hall in April 2011. The University will hold a memorial service Friday in Ames Hall at 4 p.m.
Counselors are available Thursday for West Hall residents between 5 and 7 p.m. and Friday between 1 and 4 p.m. and again between 6 and 9 p.m.
Thurston Hall residents can also speak with counselors Thursday between 3:30 and 5:30 p.m.